Dorthea Lange, Walker Evans, Jack Delano, Russell Lee. 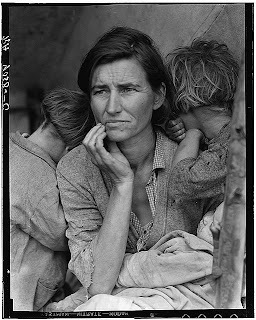 Great photographers of their day, hired by the Farm Security Administration (now the USDA) to photograph America. They traveled our nation documenting how everyday Americans lived and were coping with hard times. It was the first effort of its kind. 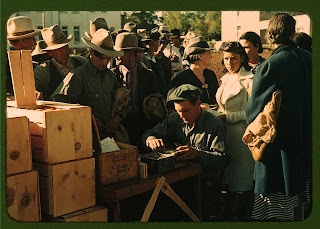 And the legendary work they produced personifies the Dust Bowl era. The photo of the Migrant Woman and Children by Dorthea Lange is perhaps the best known. And the whole period is engrained in our collective memory in black and white. Who knew? 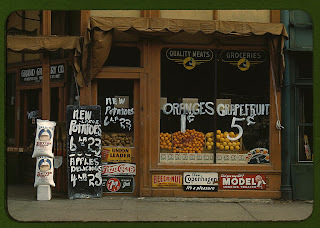 It was one of our first Kodachrome moments as photographers used the new color film stock to give a different view of those difficult times. Does color prettify the images? Is trouble better communicated in black and white? What do you think? The images at the Library of Congress are available here. A haunting memory of how we were.